1.Official correspondence sent as ordinary mail did not need to be franked; it had "Free Frank" privilege. Bur if the mail was Registered, then the registration fee had to be paid at the post office counter and postage stamps applied. The post office could be financially compensated by central government for carrying Free Frank mail, based on volume of mail and so on. 2. Free Frank privilege extended only to Inland mail. 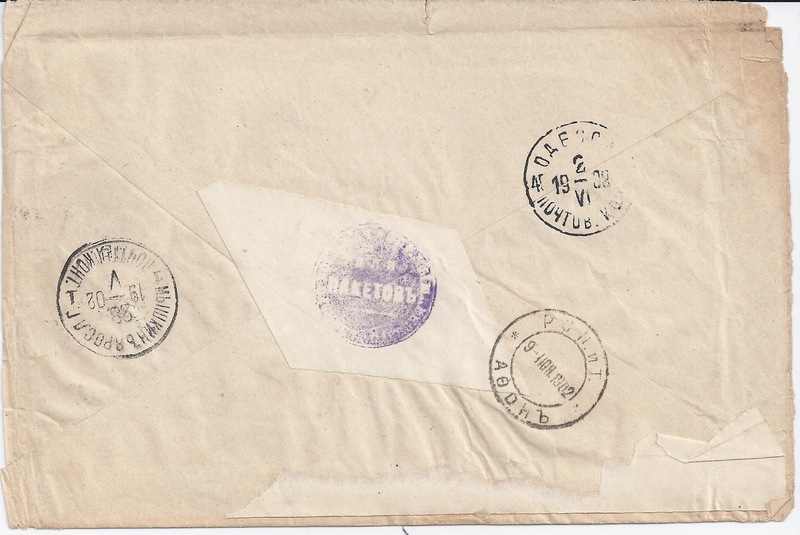 Foreign mail, ordinary or registered, had to be paid for and franked with stamps to cover the cost of the foreign part of the journey. 3. Free frank privilege was claimed by means of a Seal applied on the reverse of the item of mail and by means of a Registry number written at bottom left on the front of an item. Seals could be paper seals, wax seals or could be applied with a handstamp. The Registry book ensured accountability and was an anti-fraud measure.I don't think I have ever seen a Free Frank item charged Postage Due for improper use of the system. The paper seals have from time to time been popular with collectors and occasionally they have been passed off as official stamps. 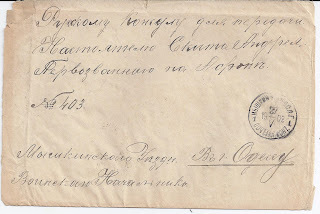 Early Zemstvo catalogues listed the pretty seals of Ananiev Zemstvo as Official Stamps and Agathon Faberge had a fine mint collection of them. The Free Frank cover shown below has a Registry number on the front, "No. 403" - for some reason these numbers are always prefaced by Roman "No" rather than a Cyrillic equivalent. On the back there is a paper seal, fairly typical in being unreadable except for the key word "PAKETOV" which is always present on seals. The interesting thing about this 1902 cover is where it is going. It starts off in MISHKIN YAROSL[AVL] with a 27 May strike on the front and a 28 May strike on the back.It transits in Odessa on 2 June and arrives at ROPIT AFON on 9 June. Now Mount Athos was Ottoman Turkish territory but Free Frank privilege has worked all the way there, presumably because the cover has been handled throughout by Russian mail services. 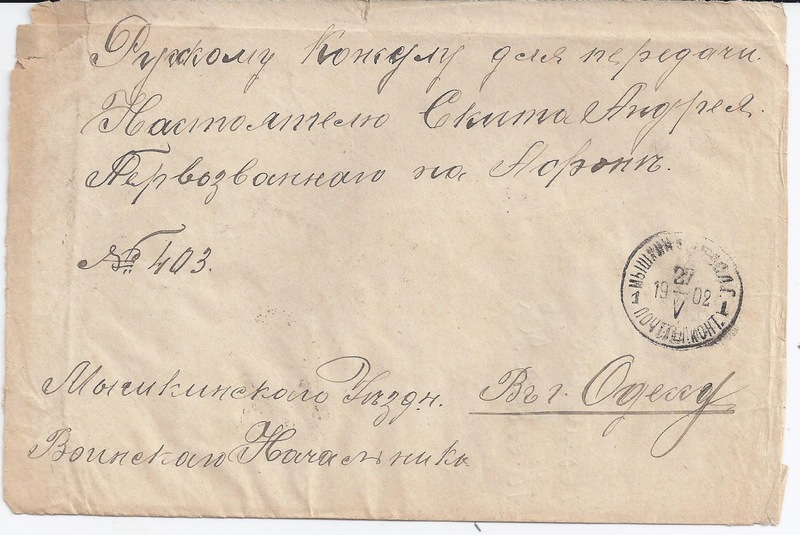 This was not always the case: ships from Odessa would drop off mail to Mont Athos in Constantinople and the ROPIT CONSTANTINOPLE office would pass them to the Ottoman post office for overland delivery. In this case, I guess that a ship dropped off mail at Mont Athos itself but I would need to do more research to insist that was the case.